Circumstances kept some Champions out of pocket midday Wednesday, but there were good reports of a fine turnout for the visiting, storytelling, reminiscing session down on the banks of Old Fox Creek. Many of the ‘regulars’ made it out and were joined by Dean and Daily Upshaw. They were well received and with luck, will make it back again soon. It was wonderful to hear that Ethel felt like keeping up the routine in spite of having had a rough week. She is a real Champion and was in her regular spot and her friends will be hoping that the week to come is less eventful for her. They say that the Eskimos have a hundred words for snow. This time of the year Champions need that many words for green. It is luscious out there even though a little more rain would be welcome. Laine Sutherland made some good garden progress on Wednesday. She and Greta planted okra, watermelons, zucchini, cantaloupe and other things. She already has corn in and will put in more. It is nice to have help and to have someone setting such a good example of productivity. Most likely she has a good song in her head while she is working in her beautiful soil. Linda’s Almanac from up at The Plant Place in Norwood indicates that during the week ahead the 26th and 27th will be good for root crops and good days for transplanting. The very next good day will be the 31st. It will be favorable for corn, okra, beans, peppers, eggplant and other above ground crops and will be a good time to plant flowers. It will also be an excellent day to say, “Happy Birthday, Alexandra Jean!” Eight is a good age for a Champion grandchild. Send your favorite garden working song to Champion@championnews.us or to The Champion News, Rt. 72 Box 367, Norwood, MO 65717. “Sowing in the morning, sowing seeds of kindness, sowing in the noontide and the dewy eve….” A person does not necessarily have to wait for the harvest to do the rejoicing. It is an ongoing thing in Champion. Linda Collins sends a message to Elva Raglan saying that she would like it if Elva would come to the Thursday Bluegrass Jam at Vanzant. Linda was there this last week and enjoyed herself. She and Elva have been friends for a long time though they do not get together as often as they would like. Bonnie and Doug Bean from Caulfield were there too. They were there with their son Sargent Daniel Bean who is getting ready for his fourth deployment with the United States Army. He has been to Iraq and to Afghanistan two times. This time he is going to Africa, starting out in Djibouti in June. This small country is on the southwest coast of the Red Sea where it joins with the Gulf of Aden. It is east of Ethiopia and north of Somalia. Daniel says he will be there for nine months and expects that he will travel around Africa quite a bit. He has been enjoying his time at home and it is clear that his folks have enjoyed having him. Thursday was his last trip to the jam until he gets home again around February. He sang “32 Acres of Bottom Land” with his Dad and they recorded it so he will have it with hiim on his deployment. Sargent Bean has Purple Hearts and the appreciation of his family and friends, his Champion neighbors, and a grateful Nation. The Comet 209P/Linear was discovered in 2004. It has left some dusty debris that the Earth will have passed by on Saturday night late giving North American sky-gazers the best view on the planet. Astronomers say that around 2 a.m. the debris will have created three or four hundred shooting starts per minute and maybe more. By Tuesday the comet will have been about 5 million miles from Earth. By the time this is in ink, it will be history and Champions will have learned when the next time the “Camelopardalids” Meteor Shower (named after the giraffe constellation) will be visible. These tense forms are tricky. It is a challenge to write a history of something that has yet to happen. For example, the Denlow School Reunion could be anything! There are always some exciting items in the auction and the potluck dinner is always extravagant and the music good. The only real unknows have to do with who is able to attend this year and how certain people behave. Summer will find the country roads full of horses and wagons, four wheelers, walkers and visitors of all kinds to Champion. It may be that J.C. Owsley will come down from Cross Timbers with that big white mule, Dot. The name now makes sense. There is a picture of J.C. and Dot on the internet and there is a nice brown dot on Dot’s big white neck just behind the long pointed left ear. In the photo J.C. is sitting up tall and straight in the saddle the way he does and Dot’s left foreleg is up in a pose that puts one in mind of the Famous Lipizzaner Stallions. The West Plains Wagon Club will be having events. Clifton Luna will have a ride May 31-June 1. It will include a fish fry and pot luck on Saturday Night. June 6-8 Jerry and Diane Wilbanks will head up a ride around the Chapel Grove RV Park. Contact Diane for more information at 683-9239. Probably those Foxtrotters have some exciting summertime stuff going on as well. Everyone knew that it would finally be summer and here it is. Thursday was the last day of school at Skyline. Summer stretches out ahead of youngsters like it is going to be months and months of wonderful, warm, free time to do as they please. They will have chores and projects, trips to the creek and company coming, but it is also hoped that they will have hours to watch the clouds, to daydream and make plans and discoveries. The ‘carefree’ time that old folks remember as some of their best time is now visited on the youth. There is ample seating on the spacious veranda of the Recreation of the Historic Emporium over on the North Side of the Square. Sit back and gaze out at Nature’s grandeur. Remember way back when but enjoy the real here and now of Champion—Looking on the Bright Side! Champions are pleased to see the smiling faces of the Skyline R-2 School Honor Graduates in the paper. Valedictorian Skyla Boyd and Salutatorian William Crawford are moving on now to a new and exciting learning environment. Their Champion friends wish them well and wish all the Skyline students a wonderful summer and another great school year to come. The Skyline staff posts on the internet, “It’s not too late to sign up for a month of fun and learning in June. There will be art, music, basketball, reading, science activities, math, trips to the pool, along with free breakfast and lunch. If you can’t find the signup sheet around the house, just call and ask for a summer school form. 683-4874.” Skyline second grader Heidi Strong has her birthday on May 22nd. One of Esther’s favorite daughter-in-laws, Teresa Wrinkles, makes merry that day as well. Kindergarten student Joseph Kennedy parties on May 29th. Celebrate! Celebrate Rachel Cohen and Jackie Green in opposite ends of the country, both dynamic, exciting productive citizens. The world is a lucky place to have you both in it—Champions. Memorial Day is said to have many separate beginnings. Every planned or spontaneous gathering of people to honor the Civil War dead in the 1860’s tapped into the general human need to honor our dead. When the official proclamation came down in 1868, General Logan said that Memorial Day is not about division. “It is about reconciliation; it is about coming together to honor those who gave their all.” The years pass by so quickly. 150 years is not so long in the big picture. A person born in 1913 has a 100th birthday this year. Exer Hector was born May 18, 1913, and died January 25, 1975. Bluebonnets are blooming over her now out on a hillside in Palava, Texas in sight of the Double Mountains and of fields she used to plow. Her children miss her still. Recent or distant, loss is loss. So it is across the Nation and around the world as people venerate those whose sacrifices paved the way for them in a day of remembrance. Wednesday in Champion is as lovely as any other day. “What is in a name? A rose (or a Wednesday) by any other name…” etc. This past one found the mid-day confab at the Historic Emporium well attended either because of the weather or in spite of it. A nice cold spitting rain and a lashing wind added but little to the subject matter of the day which ranged from pranks and hunting stories (the viability of antique ammunition) to gardening and wild life observation. Lee Ray said he saw an eagle dive bomb a hawk and take a fish away from it. Ethel Leach said those baby goats are up on Highway ZZ not 76. In addition to the Prominent Citizen, Ethel’s Bob was there, and Mr. Stone, who had chores and left early, but not as early as Chad and Glen. Don Bishop and Wes Lambert were there to greet Alvie Dooms and others came and went. Elmer Banks came and described a marvelous nap that he had on the steps coming down from his deck. It was the most peaceful and restful nap he can remember and as he awoke to the inquiries of family as to his status he had only pleasant things to report. The next day he had a call from the nurse that monitors his pacemaker who said, “Mr. Banks, you had quite a shock yesterday.” It was a surprise to him. He is a gregarious and curious fellow. He is of Scots descent and a fan of the bagpipe, and asked if the recent traveler to Scotland had seen men in kilts. “Indeed! There were some strikingly handsome kilted Highland gentlemen to be seen, especially on Sundays.” Elmer said he was thinking about getting a kilt, but friends actively discourage him. “The 28th annual Denlow School reunion is Saturday, 24 May 2014, at the Denlow Church and cemetery. Former students, friends, feuding relatives, and everyone is welcome to attend. Pot luck lunch at 12:00, an auction to follow, then music in the afternoon (bring your instruments and join in). Around 5:00, Ed Williams will fry fish and chicken, assisted by his beautiful daughter… (a recent graduate of Seymour HS). I would like to see some of those Iowa, Kentucky, and Arkansas people there, along with a lot of the local hillbillies.” This press release comes from The General, himself, who by popular request will forgo a ‘program’ this year in favor of hanging around in the cemetery visiting with friends. There is to be no hanging in the traditional sense, just some harmless loitering. “The End Came in Spring” is a play written by Mike Upshaw. His aunt Fae Krider joined her sister-in-law, Vivian Floyd, for a trip up to the Stained Glass Theater for a production last week. Her Facebook response to Mike was that it was very good and she enjoyed it very much. Shellie Gossett Folts said, “Completely different and a fun little walk down memory lane for me (high school graduation May, 1986). It was nice to see a cast of some new college-age faces on stage. I particularly appreciated the understated way you handled the central message of the show and really liked the ending. I thought it was a bold way to end it.” Now Champions are much intrigued but not at all surprised at such talent finding its way through an Upshaw. Linda’s Almanac from over at The Plant Place in Norwood says the 22nd and 23rd will be favorable for planting late root crops. Also these days are good for vine crops and for setting strawberry plants and for transplanting. The 24th and 25th are both poor planting days. They are fine for killing plant pests, cultivating or spraying. The 26th and 27th are good for planting root crops, also for transplanting. For the 28th and 30th the almanac says that any seed planted during that time will tend to rot in the ground. The 31st is most favorable for planting corn, cotton, okra, beans, peppers, eggplants and other above-ground crops. Plant seed beds and flower gardens that day too. It is best not to wait for Lem and Ned to come along to do the hard work. Get a look at Linda’s Almanac on the bulletin board at Henson’s Downtown G&G where loitering is encouraged. Champion—Looking on the Bright Side! Meanwhile, back at the Recreation of the Historic Emporium over on the North Side of the Square, the regular Wednesday bunch, spread out among the tables in the conversation lounge, had stories to tell. A certain Mr. Stone was talking about goats and indicated that he could see no good reason to ever have such as that on a place. Ethel Leach mentioned that some neighbors up on 76 Highway have miniature goats and that they are as cute as they can be. The babies are just about ‘this’ big and they can run right through the fence. She says they seem to stay out of the road, though, and scamper back through when a car comes along. Stone said that when Paul Ullman was a boy he had four goats that had huge horns. (He stretched his arms out to indicate how big the horns were. They were big.) A beau came to call on one of Paul’s sisters and while he was visiting the goats got up under his car and got stuck. It took two hours to get them out. They would jack the car up and the goats would try to stand up and they would get their horns caught up the frame of the car. It was a mess. He went on to say which sister it was who received the caller and who she later went on to marry. Mr. Ray came in about that time with a dower expression because his sister had soundly trounced him again in their regular scrabble game. He claims that she cheats and when he caught her she blamed it on her vision.” “Does she have cataracts?” asked Ms. Leach. “No, she drives a Buick,” he responded. He went on to say that he reckons women are smarter because they have more time to study. It went on like that including some protracted dog feeding ritual that is clearly headed toward becoming a legend of its own, though a person will not read about it here. Jim the Wonder Dog came up in conversation. He was an English Setter who was alleged to have a variety of remarkable abilities which included picking the winner of the Kentucky Derby six years in a row. Jim died in 1937, and is buried in Marshall, Missouri, up east of Kansas City in Jim the Wonder Dog Memorial Park. By this time Cowboy Jack had joined the idlers and they moved out to the veranda. Chores at home called. Wednesdays are wonderful in Champion. 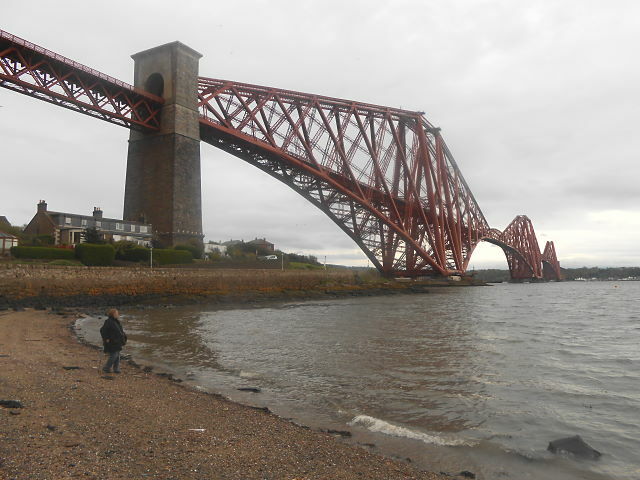 Recent travels brought one across the 1.6 mile Forth Bridge built between 1883 and 1890. It is a cantilever railway bridge that has daily traffic of 190 to 200 trains. It was the first major structure in Britain to be constructed of steel. Its contemporary, the Eiffel Tower, was built of wrought iron. From North Queensferry in Fife a person can look all the way across the inlet of the North Sea (the Firth) joining the Forth River to see the very inn, The Queensferry Inn, there in South Queensferry, Inchgarvie where the treacherous betrayal occurred that was so masterfully described in Kidnapped by Robert Louis Stevenson. Linda’s Almanac from up at The Plant Place in Norwood says that the 17th and 18th will be good days for planting root crops. Then again on the 22nd and 23rd plant root crops and do transplanting. Those ‘barren’ days in between are good ones for weeding, working up garden plots, mulching, housecleaning, cooking, laundry, or for reminiscing and reading. Recent travels brought one across the 1.6 mile Forth Bridge built between 1883 and 1890. It is a cantilever railway bridge that has daily traffic of 190 to 200 trains. It was the first major structure in Britain to be constructed of steel. Its contemporary, the Eiffel Tower, was built of wrought iron. From North Queensferry in Fife a person can look all the way across the inlet of the North Sea (the Firth) joining the Forth River to see the very inn, The Queensferry Inn, there in South Queensferry, Inchgarvie where the treacherous betrayal occurred that was so masterfully described in Kidnapped by Robert Louis Stevenson. A good book on the front porch resting up between garden chores is just what the doctor ordered. For other ailments he recommends music. “I had a home out in Texas. Out where the bluebonnets grew. I had the kindest old Mother. How happy we were just we two. Til one day the angels called her—that debt we all have to pay. She called me close to her bedside, these last few words to say.” What do you think she said? There are things about the beautiful old city that will linger in the heart of a rambler who will soon rest again in the tranquility of home. In the last few days, the last few hours as the time for parting approaches a rising swell of emotion is almost too near the surface. The plan is to stave it off and stay merry until the transatlantic flight has left the ground and then to let it go quietly in the privacy afforded by strangers. The charm of the place is in its physical beauty and its deep history, but the real joy, apart from the precious family tie, has been the great number of kind, good people whose paths have crossed with those of Champions. Giovanni Caiaiti is a young Roman in his late twenties who was in “The Athens of the North” for the first time. He took a turn in the open session at The Royal Oak and sang “Irene Goodnight” in a medley of familiar songs that fit well together. (He graciously extended his sympathies to America for having lost one of its treasures in the person of the late Pete Seeger.) It turns out that young Romans started coming to Scotland in the year AD 71. They named the place Caledonia and it was beyond the frontier of the empire. They departed in 213 leaving various aqueducts, Hadrian’s Wall and the gift of literacy. Scotland had been inhabited for thousands of years before the Romans arrived but its first written history seems to have come as a result of the association. (There are yet some marvelous Italian Restaurants in the city.) Chances are pretty good that when Giovanni’s predecessors were touring Caledonia they were met by the predecessors of Mr. Stefano Aitkenhead. Aitkenhead is a Scots language surname of medieval Scottish origin. Its oldest public record dates it back to 1372. Anyway, “Stef” is a great fan of Texas music and goes often to spend time there in Bandera, Texas. “Celtexmusic” is his moniker. He looks the part of a well-heeled country/western musician in his fine Stetson hat, but when he opens his mouth, he is all Scots and charming. Champion grandchildren, Seamus, Elizabeth, and Zac have a great Aunt Linda who lives in Waldo. She has her birthday on the 6th of May and most likely has had some nice cards and messages sent her way. Gracie Nava is a kindergarten student at Skyline with a birthday on the 7th. Skyline bookkeeper, Dixie Pierson, celebrates the next day on the 8th and preschooler Conner Jonas will have his party on the 12th of May. Jay and Alex Williams have their birthdays on the 7th and the 12th and they have Champion grandparents. Lannie Hinote keeps her facebook friends and neighbors up to date with much of what is going on at Skyline. On May 2nd she posted, “Congratulations to the Skyline Archery Team today at taking 2nd Place. We had 27 archers competing. Morgan Whitacre placed 1st in Middle School Female Division; Madison Shearer placed 2nd in Elementary Female Division; Shaelyn Sarginson placed 3rd in the Elementary Female Division and Isaam Creed placed 2nd in the Elementary Male Division. I am so proud of all 27 archers.” She was also appreciative of Rachael Brown, Debra Shearer, Morgan Whitacre, Skyla Boyd and Waylin Moon for running the archery range. She said they made the tournament a success. Lannie also posted a great picture of herself holding up a good size fish (probably five pounds!) She was out in Warsaw. Some nice Ozark creek was the scene of some “perpetual series of occasions for hope” (John Buchanan) when Dean Brixey and Richard Johnston dangled their hooks in the water. Elizabeth says they did not catch anything, but that they had a great day out together anyway. It is easy to have a great day in a beautiful place. Linda’s Almanac from up at The Plant Place in Norwood says the 6th to the 10th will be barren days. The 11th, 12th and 13th will be an excellent time for planting tomatoes, beans, peppers, corn, cotton and other above-ground crops. The 14th will be god for carrots, beets, onions, turnips and other root crops. All the good planting days are good for transplanting. The garden is out there waiting for watering and weeding. The sun is shining and food is growing. Champion! Bobby’s statue is not very imposing as it sits on the street in front of Greyfriar’s Kirk, though it gets many visitors every day. 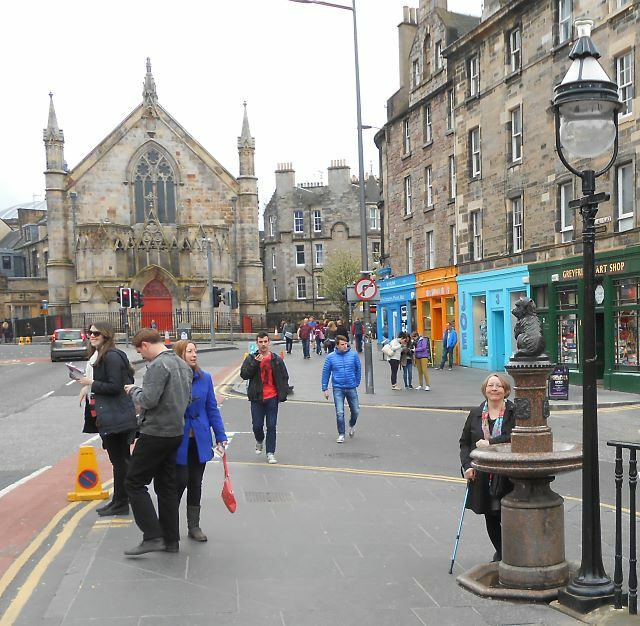 A replica of the statue together with Bobby’s collar and license can be found at the Museum of Edinburgh down on the Royal Mile. One of the best known stories in recent Scots history has to do with a little Skye terrier named Bobby. He was a shaggy little dog that belonged to John Gray. Mr. Gray worked for the Edinburgh City Police as a night watchman. When he died he was buried in Grayfriar’s Kirkyard in the Old Town of Edinburgh. Bobby then became known locally, spending the rest of his life sitting on his master’s grave. In 1867, Lord Provost of Edinburgh, Sir William Chambers, who was also a director of the Scottish Society for the Prevention of Cruelty to Animals, paid for Bobby’s license and gave the dog a collar, now in the Museum of Edinburgh. Bobby is said to have sat by the grave for 14 years. He was fed by a kindly inn keeper. He died in 1872 and was buried just inside the gate not far from John Gray’s grave. Some say this is a ‘shaggy dog’ story that was concocted as a Victorian publicity stunt. A bronze statue of Bobby is outside the church yard gate and passersby often stop to rub Bobby’s nose for good luck. This is a fairly recent ‘tradition’ probably associated with touching the philosopher Hume’s toe up on the Royal Mile. Last year the City Council of Edinburgh had the statue restored and repainted since Bobby’s nose was showing up shiny brass from under the black paint. Soon after the restoration was complete some vandal came in the middle of the night with and abrasive of some sort and took the paint off the nose. People are anxious to maintain traditions no matter how new they may be. Toby was Ed Henson’s dog. It is widely recalled that George Tom Proctor would go down to the store most days and while visiting there would enjoy a box of chocolate milk. Toby would sit down beside George Tom and wait to get to finish the milk from the bottom of the carton. Bring your own set of recollections down to the Historic Emporium over on the North Side of the Square on the broad banks of Old Fox Creek. New traditions are being invented every day. Dorothy, herself, in the” Wizard of Oz” was talking to her little dog, Toto, when she said; “There’s no place like home!” The sights and sounds of faraway lands are truly grand, but home is Champion—Looking on the Bright Side!